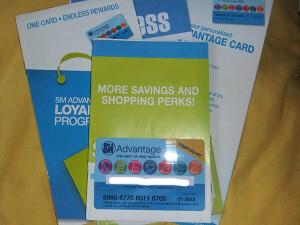 I have already earned a few points in my advantage card from the previous purchases we’ve made at SM. The accumulated points can be used in our next purchase. What’s good about having this card is that the holder is also entitled to a lot of promos, sales events and other members-only offers. Just today, I received an SMAC alert informing members of a 20 percent discount on branded rubber shoes. It’s a bit tempting to avail of this offer but I would prefer save on headphones over a pair of rubber shoes for now. This entry was posted in Discount, Freebie and tagged sm advantage card, sm advantage card holder on December 5, 2013 by Mommy Yam.